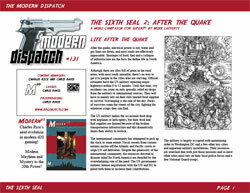 In Part 2 of Sixth Seal, the heroes' city has descended into chaos in the aftermath of the quake. Rival gangs vie for prominence and fight for turf with the remnants of the mafia, supervillains and the ragtag police force. Out of the shadows, a mysterious faction of black magicians and undead begins to carve out their own territory - strengthening their forces with the bodies of the dead. A short adventure in which the heroes must defend a UN shipment of desperately needed food to the city's starving refugees and shut down a black market in super-weapons that has sprung up in the remnants of the tech district. 8 quick play scenarios that introduce the PCs to the various factions in the city. These can be used to spice up other adventures or strung together to simulate a patrol of the ruined city.